Abies recurvata, first described in 1906 by Maxwell Tylden Masters (1833–1907), is commonly known as Min fir, or as 紫果冷杉 (ziguo lengshan) in the Chinese language. It is named for the Min river in China's Sichuan province. Description. 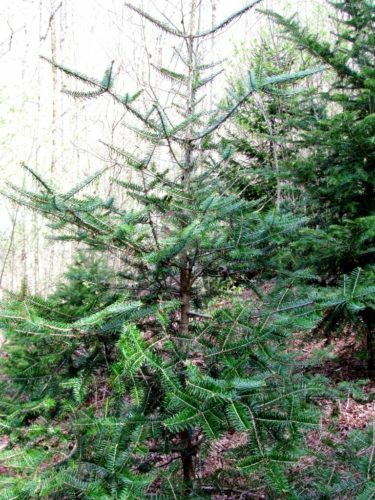 Min fir is an evergreen coniferous species of tree which will grow to a mature height of 200 feet (60 m) tall with a 100 inch (250 cm) diameter trunk, measured at breast height. It usually grows with a single straight trunk and a pyramidal crown of horizontally spreading branches which becomes flat-topped with age. Bark at first, is smooth and gray, later developing papery flakes, finally becoming dark gray or red-brown, rough, fissured, and flaky. Branchlets are yellow or yellowish gray, turning grayer in later years, firm, shiny, ridged between the leaves. Leaf scars are circular, and light gray. Leaves spread radially, appearing 2-ranked, strongly ascending or recurved on upper side of branchlets (especially on sun foliage). They are bright green on upper surfaces and slightly glaucous on lower surfaces. They are stiff, sharp-pointed, 0.4 to 1.2 inches (10 - 30 mm) long by 0.07 to 0.14 inch (1.9 - 3.5 mm) thick at the base. Stomatal appear in 2 gray-green bands on lower surface, usually present in 2 to 8 lines near distal end of upper surface. Pollen cones appear on lateral branches. They are pendant, 0.4 to 0.6 inch (10 - 15 mm) long, yellow in color with reddish microsporophylls. Seed cones, often clustered, are also produced on lateral branches. They are erect, ovoid or cylindric-ovoid in shape, purple at first, maturing brown-purple, 1.6 to 3.2 inches (4 - 8 cm) long and 1 to 1.6 inches (2.5 - 4 cm) broad. Seeds are cuneate, ca. 0.3 inch (8 mm) size with a 0.12 to 0.2 inch (3-5 mm); dark brown or black wing. Distribution. This species is native to China and Tibet—south of Songpan along the Min River in Sichuan. It typically grows in a cold climate with 27 to 40 inches (700 - 1,000 mm) of annual precipitation. Attribution from: Farjon, Aljos. ©1990. Pinaceae: drawings and descriptions of the genera Abies, Cedrus, Pseudolarix, Keteleeria, Nothotsuga, Tsuga, Cathaya, Pseudotsuga, Larix and Picea. Königstein: Koeltz Scientific Books. Abies recurvata — a young speciemen at Cox Arboretum, Canton, Georgia. 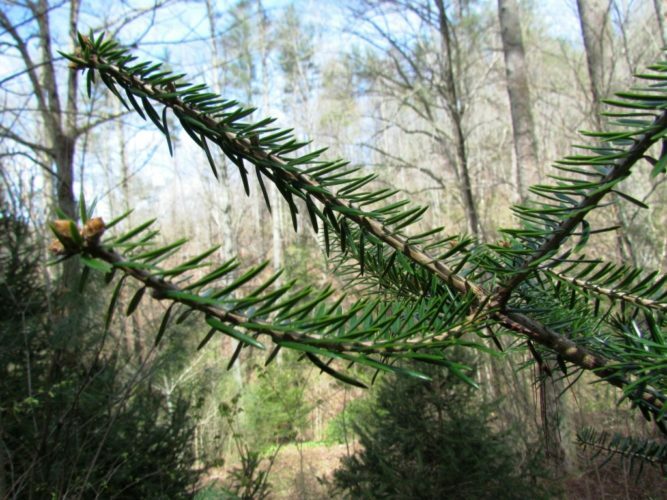 Abies recurvata — a closeup of a branch and foliage. 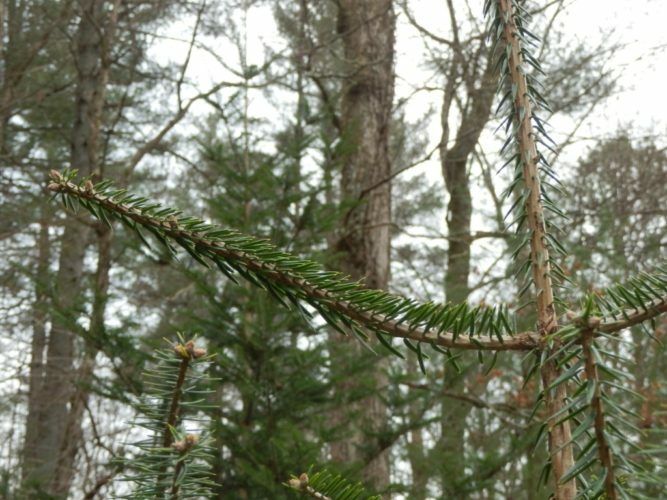 Abies recurvata — a closeup detailing the recurved needles.